The rain clouds held off just long enough for Leesburg’s loyal boarders, bikers, and in-line skaters to break in the new Eric Brown Skate Plaza at Catoctin Park. Saturday morning’s ribbon-cutting ceremony also served as a time to honor Brown. Two decades ago, he was a 15-year-old frustrated with the lack of safe places to skate. His vision, along with the guidance town resident Jim Kershaw, rallied support for the town’s first skatepark, which opened in 1998. The outdated skate park was rebuilt this year. At a cost of $880,000, the new, 12,000-square-foot concrete skate park features some major upgrades, including a bowl, vertical wall, and street elements. “Without Eric’s vision and Jim’s support of Eric’s vision we probably wouldn’t be here today for phase 2,” Parks and Recreation Department Director Rich Williams told the crowd gathered at Saturday’s ceremony. Rob Fulcer, the long-time chairman of the town’s Parks and Recreation Commission, credited Mayor Kelly Burk with helping to see this project through to completion. “This was Mayor Burk’s baby,” he said. Members of the Parks and Recreation Commission, left, participated in the ribbon-cutting ceremony Saturday morning, along with Eric Brown and his mother, Wanetta Langley, Jim Kershaw, Councilman Hugh Forsythe and Mayor Kelly Burk. 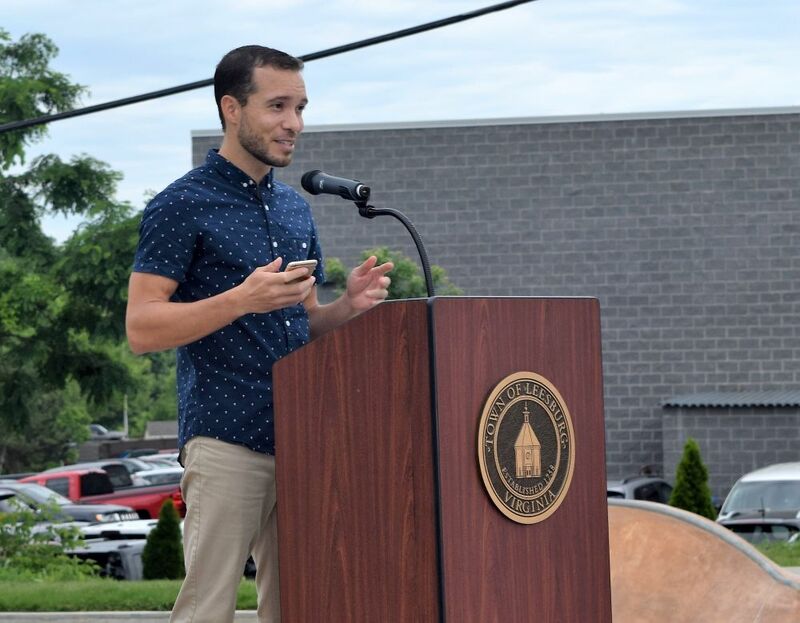 Burk recalled receiving an email from a young skateboarder a few years ago calling attention to the disrepair at town’s skatepark. When she toured the site with Williams and some young skatepark users, Burk said she was “shocked” at the state of the facility. 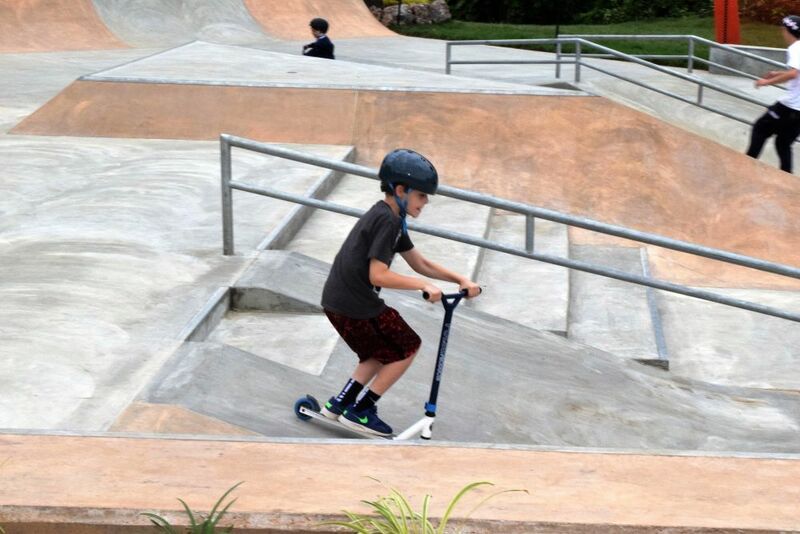 When it was found that simply repairing the skatepark would be just as expensive as replacing it altogether, the Town Council put the project in Capital Improvements Program. That, she noted, did not come easily. There was a renewed debate about whether the skatepark was needed at all. Some council members wanted to see it moved to Ida Lee Park or elsewhere in town. Others simply wanted to repair it instead of replacing it. When the project costs escalated because of soil conditions on the site, further debate ensued. 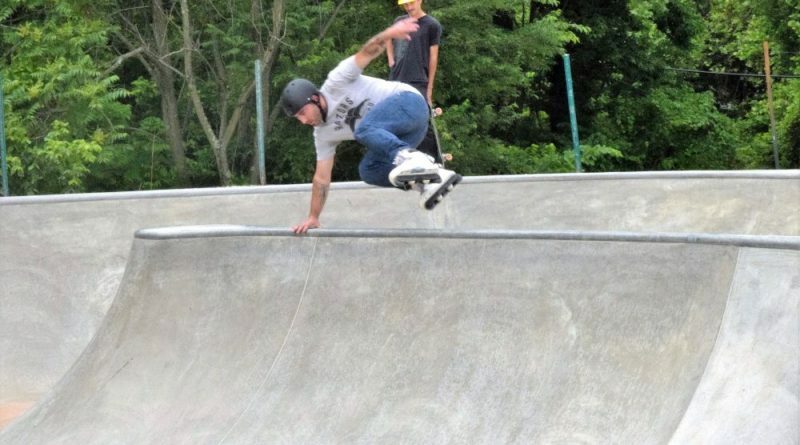 To make the project even more complex, a boundary line adjustment with the neighboring Loudoun County Volunteer Rescue Squad was needed to allow both for the relocation of the skatepark, and to aid in the future expansion of the rescue squad. Eric Brown delivers remarks during Saturday morning’s ceremony. Fulcer also made sure to recognize Brown’s mother, Wanetta Langley, during the ceremony. Langley was the one who encouraged Brown to reach out to his former baseball coach, Frank Buttery, who at the time of was serving on the Town Council. It was that exchange that got the ball rolling to funding for a skate park. Harkening back to his days at Loudoun County High School, where he attended school with Langley, Fulcer joked how she often would pass him on the track. While she didn’t make it to the Olympics, “you’re a gold medal mom,” he said to her. Brown, now in his 30s and living in Hawaii, was also in attendance Saturday. 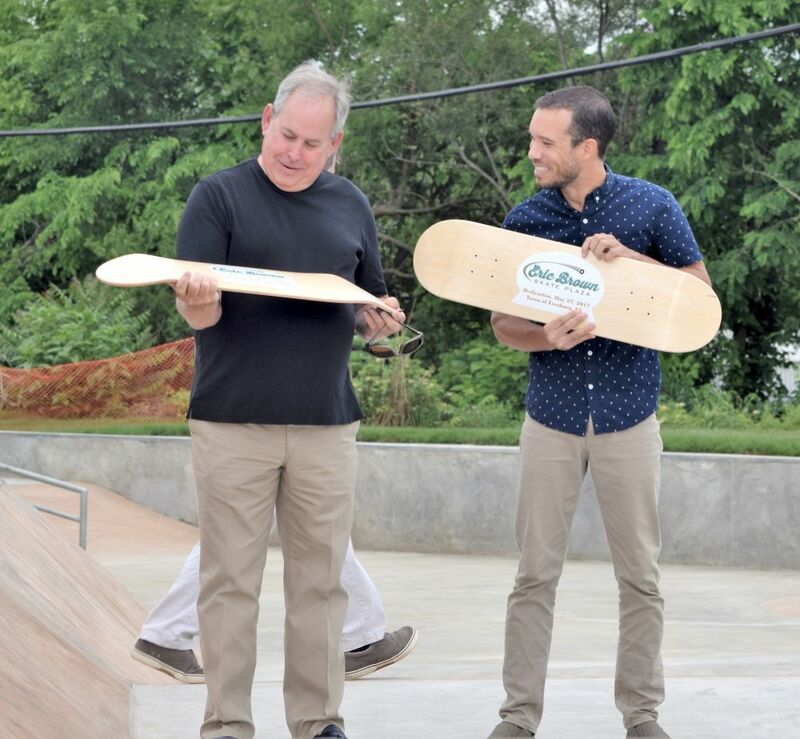 He thanked those behind the design, construction, and implementation of the new skate park, which he called “a masterpiece” that was “bigger than my vision.” Among those he recognized was the late John Johnston, a long-time planner with the Town of Leesburg who was behind the design of the original skate park. Johnston recently died after a battle with cancer. Jim Kershaw, left, and Eric Brown were given commemorative boards from the Town of Leesburg. The two have been credited with being the driving force behind the opening of the original skatepark in 1998. $880,000 for a skating place? This is “Mayor Burk’s baby?” She needs to go. All of them who voted for this waste.